Herriman • Tuesday morning before training, Real Salt Lake coach Mike Petke showed his team the tape of the first 30 minutes against D.C. United. It was the only period of the game that felt good for RSL after a string of unfortunate events led to an ugly 5-0 loss. In the days after a game that personified Murphy’s law, RSL’s players were more focused on looking ahead to this Saturday at Los Angeles Football Club rather than looking back. But for some, it seemed the sting of experiencing the game unravel before their eyes lingered. The optics of losing the way RSL did to United didn’t look great, mostly due to the final score. For Petke, however, the score didn’t matter. Once the team lost two players due to red cards, he just wanted to finish the game without any of his players incurring injuries. And while fans, and even some players on the team, would rather forget the final 60 minutes, Petke will use that stretch to his advantage, he said. Sebastian Saucedo, sporting a new hairdo, said he thought the first 30 minutes against D.C. were “great.” A few seconds later, he adamantly rebuked the idea that RSL should be judged on the final score of that game and the numbers left on the field. Petke said the D.C. debacle was already out of the minds of him and his team. 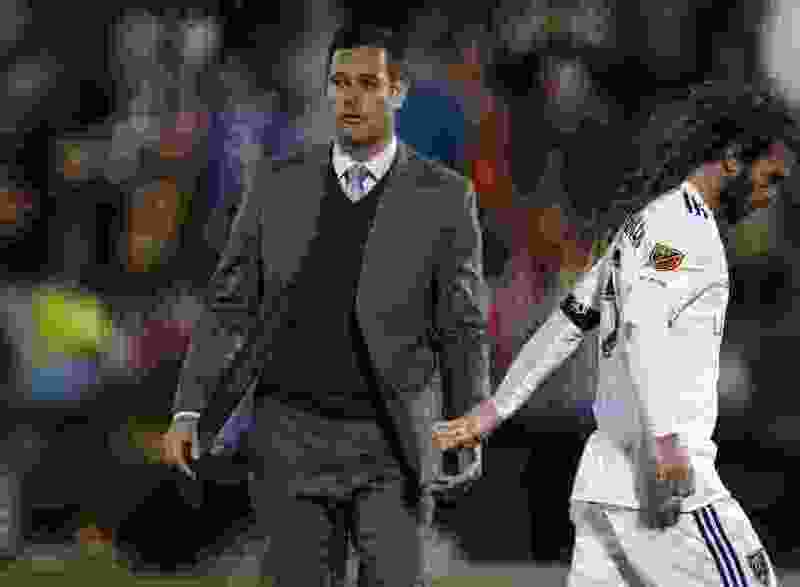 Veteran midfielder Kyle Beckerman said forgetting the game was the team’s only real choice, and it was “fairly easy” doing so. But Onuoha seemed to take something of value from those difficult 60 minutes. He said the nine players that finished the game “represented themselves well in a difficult situation.” He added that although D.C. ended up amassing five goals against RSL, it could have been more if Real’s nine players had given up. Joao Plata, who has not trained in recent weeks due to an ankle injury, returned to the training field on Tuesday. Although he did not participate in drills with the rest of the team, he did some running with a trainer. Petke said Plata hasn’t been in “any live practice action,” and did not provide an update on his potential availability for Saturday’s game. Also seen on the field Tuesday was Justen Glad, who has been out all season with a broken toe. He did not have any sort of protection on the affected foot, but he did not do any practice activity either. He sat on a bench and watched his teammates train. The initial timetable for Glad’s return was 4-6 weeks.